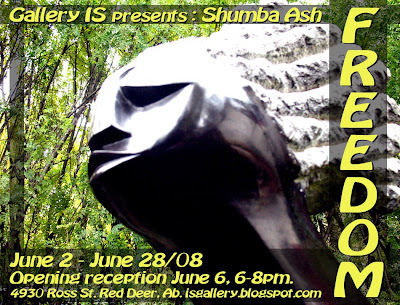 Gallery IS, is pleased to announce its next upcoming solo exhibit by Edmonton sculptor Shumba Ash. "Freedom" is a collection of stone and metal sculptures in Shumba's unique style. This style is influenced by his home country of Zimbabwe, and his new home of Canada, to create his Afro-Canadian experience. 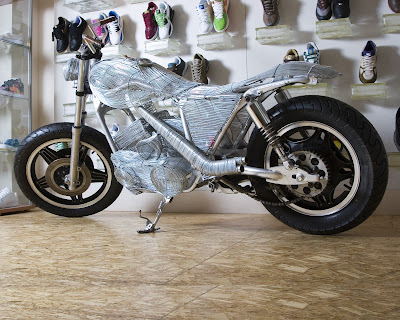 We are also very excited that Shumba's life sized wire sculpture of a motocycle will be included in this show. "Freedom, do we know it, do we appriciate it and after fighting for it do we loose it again; to fight for it again." Freedom of expression is what many have died for and are fighting for, how blessed am I to have this artistic freedom. Am I, are we taking full advantage of it? "Freedom" will be on display at Gallery IS from June 2nd - June 28th. The opening reception will be friday June 6th, 6-8pm. Open call to all artists. We are now accepting submissions to "Local Images", our second annual summer group show. This show is themed for artworks dealing with Red Deer, and the landscape, buildings, people, animals, and memories we share from our home town. All media are acceptable. Professional, emerging, and student work will be considered. A maximum of 3 submissions please. The deadline for submissions to the "Local Images" group show is June 14th, 08. Notice of acceptance will be given by June 21st, 08. Delivery of accepted artwork must be made by June 28th, 08. Official show dates are June 30th to July 26th, 2008. Opening reception is July 4th, 08. 6-8m. All submissions must be made to the Gallery IS. Submissions can be made via email.